About our products| KANTO Electronic Application and Development Inc. In microwave material measurement, it is essential to select a right measurement method according to measurement objectives. We develop, manufacturer, sell, and support a wide variety of material test solutions for your successful material evaluation. Reliable high quality fixtures are absolutely necessary for accurate and repeatable material measurements. Kanto Electronic Application and Development, with more than 30 years of experience, continue providing high quality test fixtures containing our measurement know-hows. We also emphasize technical support to make sure that our customers can measure successfully from the beginning and for many years. 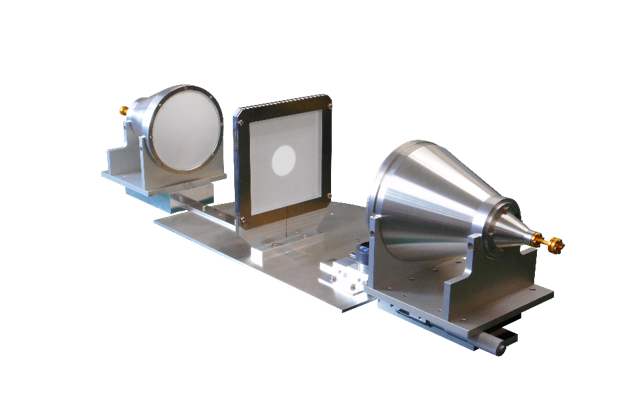 The resonator perturbation method enables high-accuracy measurement, therefore it is ideal for evaluation of low loss dielectric materials. By applying our harmonic resonance of the rectangular waveguide to the resonator perturbation method, accurate multi-frequency-point measurement becomes available. It is possible to calculate the permittivity/permeability based on the S parameter of the transmission line including the material to be measured. The free space method is indispensable to material evaluation in microwave, which can flexibly deal with a wide range of applications such as permittivity/permeability measurement and oblique incident reflection measurement.